Initial considerations include your location, participants, & possible dates. Programs typically book 6+ months ahead. You can check the COMICS CALENDAR to see if your preferred dates are available. For day trips, mileage is calculated from Henniker, NH. Rates vary widely; we’ll discuss that via email. 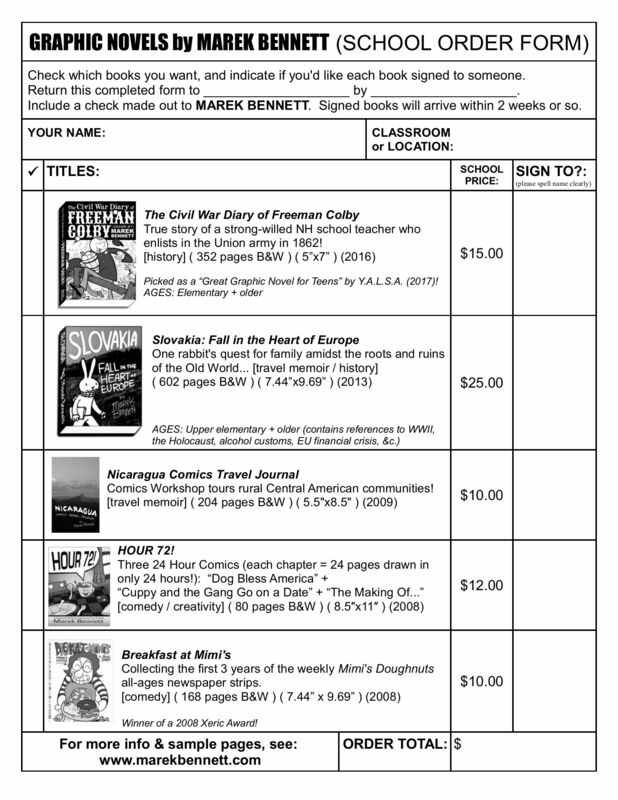 Other regular sources of funding include local schools, PTAs, and community organizations like historical societies, Rotary clubs, &c.
Consider these CURRICULAR CONNECTIONS to integrate COMICS WORKSHOP with your ongoing programs & curriculum. Also, I can send advance copies of my graphic novels & works in progress, as desired. These PROMO POSTERS & GRAPHICS can help share & promote your event. Be sure to like Marek Bennett’s COMICS WORKSHOP on Facebook & share your events with your network. Become a patron @ Patreon to get lots of news, updates, & sneak peeks at works in progress. I can leave the signed books at your location on the final day of the program, OR mail them afterwards by arrangement. I’m scouting about for potential programs to book for Manchester Artists Association meetings–a 45-minute program not a workshop. Passive audience. Is that something you’d be willing to do?